Over the years my race photography has improved with a lot of practice. What I have learned is that great photos are more about the eye, and the opportunity, than the equipment. When it comes to equipment I use it all from an iphone, a compact Sony camera, to my large Pentax with numerous lenses. I like getting the unusual shot, taking close-ups(zoom), and capturing a moment between fans, riders, coaches, reactions, exhaustion, excitement. Go broad to capture the mood and setting, but zoom into capture human subjects. My biggest tip is to see the race with your own eyes. Get as many photos as you can of yourself and your family and friends at the race. Take a sweeping video of you enjoying the scene at the race. And share those on social media. But when the race actually comes, put down the camera and WATCH IT. Peter Sagan or Taylor Phinney might only pass you once and you will miss looking into their faces if you are looking into your camera. It also pays to know how to move around at a bike race. I often arrive early to map out how to get to and from different key areas of the race. Good shots can be gotten near the teams buses, near the sign-in stage before the start, at the start ramp of time trials or on the corners, or in the area just past the finish line where riders stop to meet their soigneurs post race. Or out on the road at KOM markers where the riders slow down slightly at the passes and the atmosphere is fun. At race starts, I admit I sometimes set the camera on auto and use the zoom extensively. Because I spin constantly to react to riders approaching and leaving, taking in different light and length in shots, I let the camera do its thing and put my time into recognizing the riders and who I want to capture: who I think might be in the break, might win, might be the next big thing, or of interest to the fans. At other times I experiment with focal length and either bring the whole picture into view or blur out the background to highlight the subject. I take lots of photos, most aren't so great, but plenty are fine. I have learned it is all about the light in fast bike racing, especially in Colorado where I like the northwest facing corners. I use all the settings when capturing cyclocross races to get a variety of shots. I do not like standing in the same place for long. Cyclocross races are excellent for practicing cycling photography - your subjects come by repeatedly and the whole scene is fantastic atmosphere. Read more: My Photography - how I get the shots, by Pedal Dancer®. Also read: Photog’s View: Darrell Parks 2016 Cycling Calendar, by Darrel Parks in PezCycling News, about photos he captured at the Tour of California for his annual calendar. Also read: Jim Fryer and Iri Greco of Brake Through Media who write a fantastic series for VeloNews titled The Shot about how they achieve iconic images of the races in Europe. How did I get this shot? I sat on the ground, on the dirty pavement, and watched the winner of the 2015 Tour of California pass by as I pushed the shutter button. My work was easy, Peter Sagan's hard work won him the race! What is it like being a credentialed photographer at the race? I get to wear a fancy PHOTO badge that flips and spins in the wind and gets tangled up in my camera straps. I also get to wear the most unbecoming numbered blue vest (if I am deemed worthy in the great pecking order of photographers) that many a photographer has sweated in prior to my own wearing of the vest. There is an unspoken dress code among photographers that we wear black or khaki, which gets really hot on sunny days and appears so boring in the midst of all the colorful fans. I think we wear black because we are not supposed to stand out (as if the camera focuses in on us anyway). There are other norms I had to learn, like who stands where in the pack at finish lines or podium presentations. The yellow bib photographers are like mini-gods, I must give respect to the yellow-bibs, those who are more 'accomplished' and arrive late to the pack at the finish line on the back of motorcycles (really they are just bigger than me ... and more serious). Basically photographing a pro bike race is juggling a series of implied laws yet trying to be unique within the boundaries. The pressure is intense, the fun is great, the reward is memorable. In response to the intensity, I introduced the smile. I can say it took me five years to melt the ice with that smile. Five years of smiling and getting to know people, making friends, not stepping on toes and being really really nice. All while moving around the venue like a banshee set on discovering the next great photograph or story. At times I feel intrusive by snapping photos of strangers, but I have enjoyed recognizing the riders and seeing their growth throughout their careers. For me, it really is about discovering what makes a particular competition excellent. Finding the stories in the people, discovering a new perspective and sharing my enthusiasm by participating in a sport I love. Without the fans the sport of cycling would be so dull. If the riders do not notice the beautiful scenery they race through, they certainly remember which towns had huge crowds. My purpose in conjunction with the race is to help the crowds gather. To tell the story of the fan. 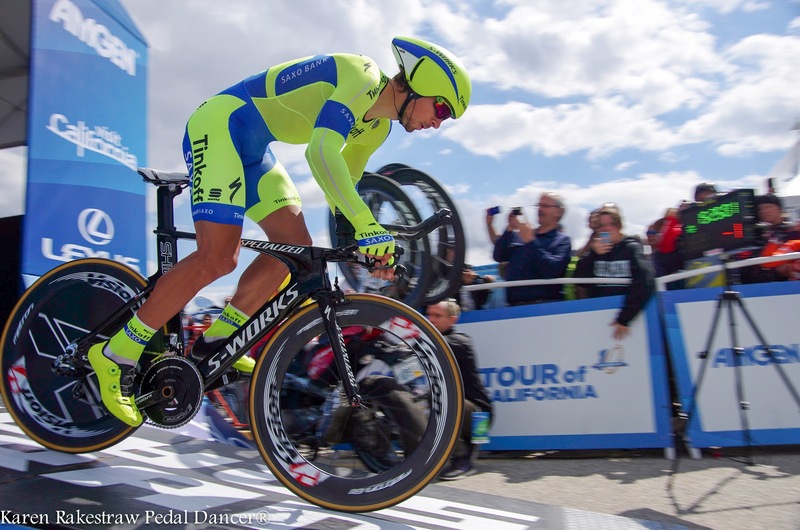 ​I look forward to attending the 11th Amgen Tour of California. How did I become Media? I had to apply through an application form for media. I had to prove I worked for a publication which shone a positive light on the event and reached a community of old and new followers. I first got up the nerve to apply in 2011 when I realized, hey I am already promoting this race (for free), I want better access. I later discovered that a "photo" badge would get me into far more places than a "media" badge (there is a difference and it is printed on the badge). I can always do the job of media while photographing a story, but since I started as a writer I had to up my game in photography. Pictures might be worth a thousand words, but I have come back to the truth that the story matters. The story is the race. And the fans and sponsors who support the race by showing up. What it is like being Media at the race? Firstly, I had to drop my old habits of jumping barriers, hanging out with family and asking anybody the silliest questions. I had to remind myself not to ask Mark Cavendish, who was standing right in front of me, for an autograph, because 'Media' persons don't that. I do however have a tradition of asking the overall winner to sign my badge after the last press conference. I keep them, hanging in my bike room, which is covered with cycling memorabilia. I have had the experience, on a number of occasions, of riding inside the Media car during the race along the race route. Let me tell you, it is true what they say - it is crazy out there on the road with motos zipping this way and that and the race radio reporting in multiple languages. But most of the people in motion following the peloton have a history together; they are experienced and they know the procedures and roads. Steve and Terry who have driven the two Media cars for many years in the major American Tour races are excellent drivers (Terry being an ex-racer himself). Life on the road as one of the many photojournalists chasing the race, is a series of very long days of scouting out the stage, planning on the map where to get shots, capturing 1000s of photos, being severely dehydrated, rushing to the podium, maybe to the post-stage press conference, downloading, editing, posting, writing, finding food somewhere,driving to the next town, unpacking, packing and trying desperately to keep up with what is happening in the real race. The race becomes what is happening in front of my square footage view unless I read social media or other news reports. It is exhausting, but everyone stays in good mood knowing we need each other to get through the week, stage after stage. Ideally I think it takes a crew of three to really cover a stage race well. A driver, a navigator, a planner/reader of race happenings. And definitely two out of three need an excellent sense of humor, patience and a love of adventure; maybe all three. The type of stories I write need a light-hearted human and humorous approach. I try not to let the physical exhaustion over-power the pure giddy excitement I feel about being at a bike race. I love pro cycling, I love that there are so many moving parts and so much more to learn about the sport. I love that the competition is so unknown and yet the best riders, who often know each other well, and perhaps have been teammates on other teams, put all aside and try their very best to win the race, because each race is a new chance to prove themselves as a champion. Read more specific Spectator Tips, Fans Education and How to Watch the Amgen Tour of California, starting in San Diego this Sunday! Remember my new website Tour Chaser (TourChaser.com).